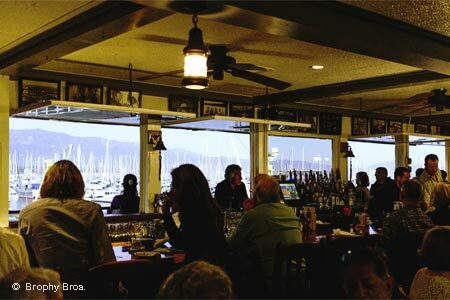 Brophy Bros. is known for fresh-caught fish and harbor views. : You’ll find a bustling scene of fishermen, young professionals and sand-sprinkled beachgoers --- as well as a wait nearly every night of the week at this true-blue waterfront institution. Décor is simple, and the waitstaff bustles about, but the view is a big selling point. Expect steamed mussels and clams with extra broth for crusty sourdough bread dipping. Dungeness crab cocktail, oysters on the half shell and fried shrimp round out the menu. Fresh fish specials, such as grilled white sea bass from local waters, mahi mahi dusted in Cajun spices and pan-blackened yellowtail are highlights --- all simply prepared with no fancy sauces. New York steak is available, too. Libations are always in order, and though the wine list is fairly basic, there’s a great selection of beer on tap or by the bottle, and a full bar. If you can’t get a seat --- they don’t take reservations --- stand outside and watch the workings of the harbor until a table opens up. There’s also a Brophy Bros. in the Ventura Harbor, which is virtually identical to the original.